Turkish Prime Minister Binali Yıldırım on June 19 harshly criticized a U.S. Senate decision to block F-35 sales to Turkey. “The decision is an unfortunate development,” Yıldırım told reporters. “Turkey is not without alternatives. Such attempts are regrettable and goes against the soul of strategic partnership,” the prime minister said. Yıldırım’s comments came after the U.S. Senate on June 18 passed a $716 billion defense policy bill including an amendment prohibiting sales to Turkey of F-35 Joint Strike Fighter jets made by Lockheed Martin Corp. According to the NDAA, U.S. President Donald Trump should certify that Turkey does not threaten NATO, purchase defense equipment from Russia or detain U.S. citizens. Senators included the legislation because of the imprisonment of U.S. pastor Andrew Brunson in Turkey’s Aegean province of İzmir on terror charges and Turkish government’s decision to purchase S-400 air defense system from Russia. The amendment claimed that purchasing the S-400 system from Russia increases tensions and risks to the NATO alliance. The U.S. Defense Ministry is supposed to prepare a report on relations with Turkey in 60 days. Any sales of F-35 and F-16 fighters, Patriot air defense systems, and military helicopters by Pentagon to Turkey will be blocked until the report is submitted to the Congress committees. 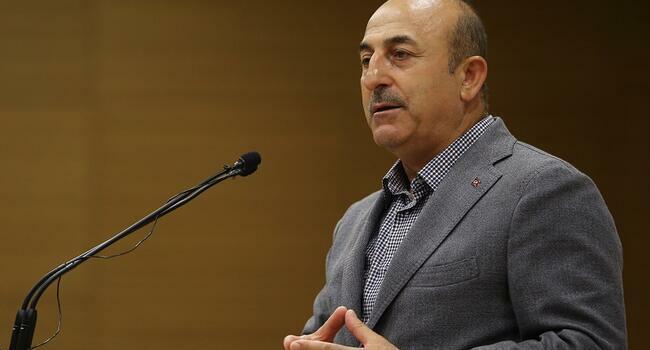 Criticizing the U.S. for trying to force Turkey not to purchase the S-400 air defense system from Russia, Turkish Foreign Minister Mevlüt Çavuşoğlu on June 4 recalled that Turkey had been trying to purchase the Patriot air defense system from the U.S., but the missiles have never been sold to Turkey when they were needed the most. “This is the reason why Turkey, which is in urgent need of these weapons, has chosen to purchase them from Russia,” he added during his visit to Washington. Touching upon the F-35 fighter jets, Çavuşoğlu also emphasized that if Washington, as the worst-case scenario, decides not to sell F-35s to Turkey, then no one can tell Turkey not to buy aircraft from a second country or not to produce its own. According to the F-35 project agreement, the first two F-35s must be handed over to Turkey in the U.S. by June 21 for training and testing purposes. Before the Senate bill can become law, it must be reconciled with one already passed by the House of Representatives. That compromise measure must then be passed by both chambers and signed into law by Trump. The measure also includes an amendment to bar the U.S. military from providing aerial refueling support for the Saudi-led coalition in Yemen unless U.S. Secretary of State Mike Pompeo certifies that Saudi Arabia is taking urgent steps to end the civil war in Yemen, ease the humanitarian crisis there and reduce the risk to civilians. It also overrules the White House deal with Chinese telecom firm ZTE and re-imposes a ban on hi-tech chip sales to the company.